Mr. Harvey Andrew McGrath is a Co-Founder at Revere Capital Advisors LLC. Mr. McGrath served as the Chief Executive of Man Group plc. He managed the IPO in 1994. Mr. McGrath has over 25 years of financial services industry and international trade experience to Metropolitan. He serves as Chairman of the London Development Agency, he is Co-chair of the Mayor of London’s Enterprise Panel and Chairman of Governors of Birkbeck College, University of London. He serves as the Chairman at Metropolitan Venture Partners. He is also Chairman of Heart of the City, Prince’s Teaching Institute, the Royal Anniversary Trust, Children and Families Across Borders (CFAB), icould and the Mayor’s Fund for London. Prior to taking on as the Chairman of the London Development Agency, Mr. McGrath was the Chairman of London First, a Director of Gateway to London and the Chairman of the East London Business Alliance. He is a founding donor and Trustee of New Philanthropy Capital and a Trustee of the Royal Anniversary Trust. 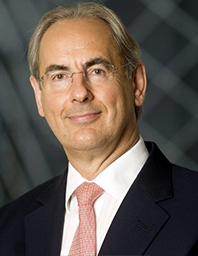 He served as the Chairman at Man Group plc until 2007. Mr. McGrath holds an M.A. in Geography from St Catherine’s College, Cambridge.